At this year’s Outdoor Retailer + Snow Show in Denver, Colorado, one of the most important conversations currently taking place in the outdoor industry took center stage: diversity and inclusivity in the outdoors. Throughout the four-day show, panel discussions held at The Camp inside of the Convention Center spurred thoughtful conversations on how the industry as a whole can work to make the outdoors a safe and welcoming place for everyone. This year’s show featured more diversity panels and educational seminars than any other show to-date, and EO contributor, Sonya Pevzner was a mainstay at nearly all of them. Here’s what she learned when she tried to attend each and every panel discussion on diversity to find out what exactly the industry is prioritizing when it comes to diversity, equality and inclusion in the outdoors. The first panel I attended was moderated by REI’s Force of Nature Business Leader, Laura Swapp (far left). According to Swapp, The Force of Nature campaign was designed to be more than just a marketing ploy to appeal to women. It was created as a holistic, multi-point approach to elevate women in every facet of the outdoors. The campaign has gained success largely in part by critically examining a part of the market they had been chronically under-served, and by extending sizing. 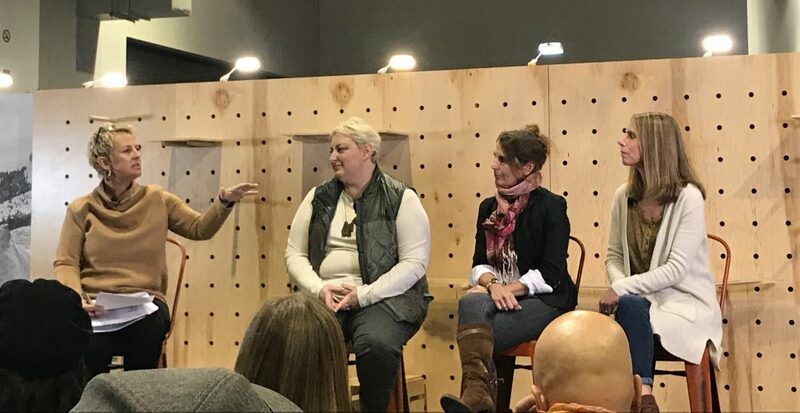 Andrea Kelly of Columbia Sportswear, Ellen Krimmel of prAna and Michele Orr of REI Co-op discussed ways their brands have been working to offer better quality clothing in larger sizes. Plus-sized women in the United States represent 67 percent of the demographic, but are only 1-2 percent of the media representation. Even within the Columbia brand, which prides itself on offering large and tall options for over two decades, only 20-40 percent of the clothing has extended sizes. Ultimately, the women on the panel want the following: a universal shopping experience, no compromise in quality, price parity for larger items, a comprehensive fit based on live models rather than a scaled-up smaller version, technical products featured alongside lifestyle products, and an overall effort towards body positivity and not just size variety. Loud voices spur change, and with women like Ashley Graham featured on the cover of Sports Illustrated and Melissa McCarthy creating her own clothing line in response to a lack of apparel that suited her size and style, it’s clear that extended sizing should be a priority for brands. 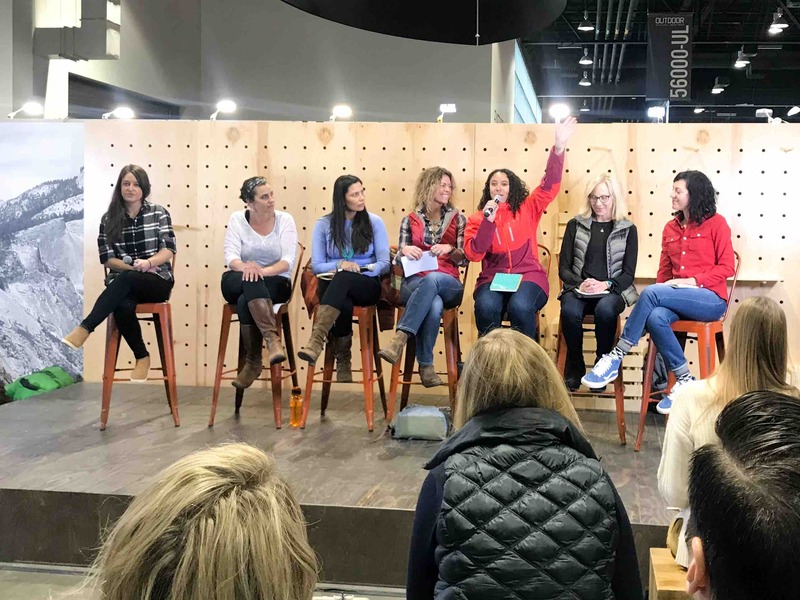 The action sports panel, hosted by Lisa Dougherty of RANGE Magazine, discussed the underwhelming participation of women at high levels of the action sports field. 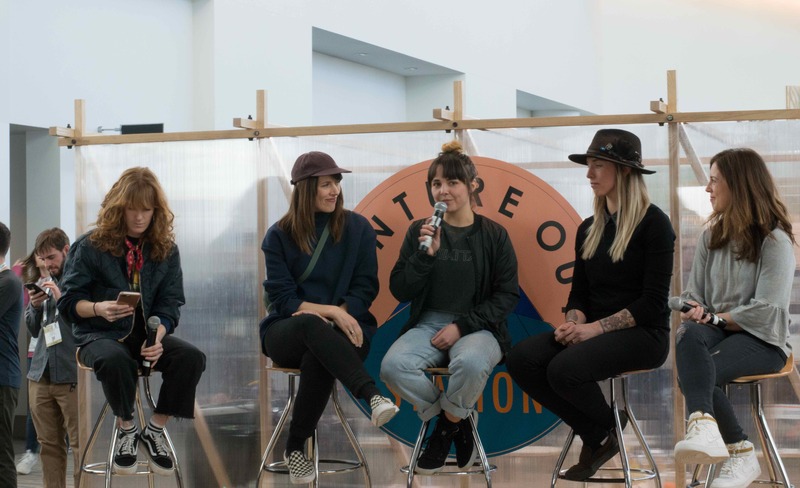 Jenna Kuklinski of Nikita and Bonfire, Rian Rhoe of Jam Collective, professional snowboard mountaineer—Amanda Leigh Hankison and Barrett Christy of Mervin Manufacturing, have all been frustrated by the lack of representation and outreach for women in sports like snowboarding and skiing. Some of the challenges to inclusivity that they named include lack of media and marketing materials targeted towards young girls, including women in marketing materials but only within the lifestyle branding, a “pink it and shrink it” mentality for women’s snowboards but with limited options, and a lack of women’s-specific boards in larger sizes and more aggressive styles. When brands target women as a single demographic, without considering the diversity of their female customer base or the fact that (gasp!) some women might want different boards for different terrain, they lose out on a huge potential market. The future of action sports, however, is not bleak. Young snowboarders are blazing their own paths, eschewing traditional sponsorships in favor of creating and curating their own media content and branding on social media channels. The idea that girls can’t play with toys that are made for boys is long dead and should be buried where it belongs. Looking to the future, the advice for women (and men) is to look out for the younger generation, and to sponsor and mentor young athletes and professionals, hire women for high levels of management and support paid family leave (or start your own company! ), along with establishing assertive language (I am a snowboarder vs. I snowboard), and looking in all directions for inspiration—not just up. In the end, there’s hope for a world where girls and women don’t have to struggle to get fair access and representation. Generation Everyone: How do we bridge the generation gap? 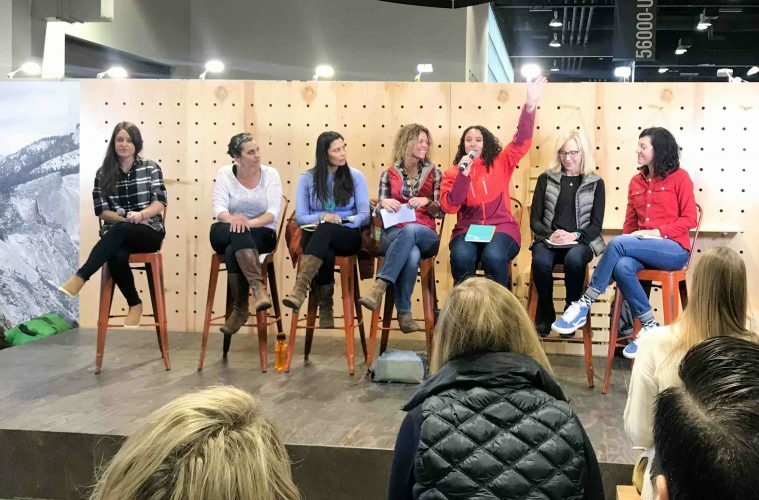 From left to right: Amanda Goad of BoldBrew, Shanti Hodges of Hike It Baby, Natasha Hale of Grand Canyon Trust, Jen Taylor of Mountain Khakis, Kami York-Feir of Osprey, Kristin Carpenter-Ogden of Verde Strategy and Jen Gurecki of Coalition Snow. Diversity in the outdoors, as anywhere, strengthens the entire community, and this is also true for varying-age and experience leves. The intention of this panel was to bridge the generational gap and learn from the experiences of the people who have gone before us. 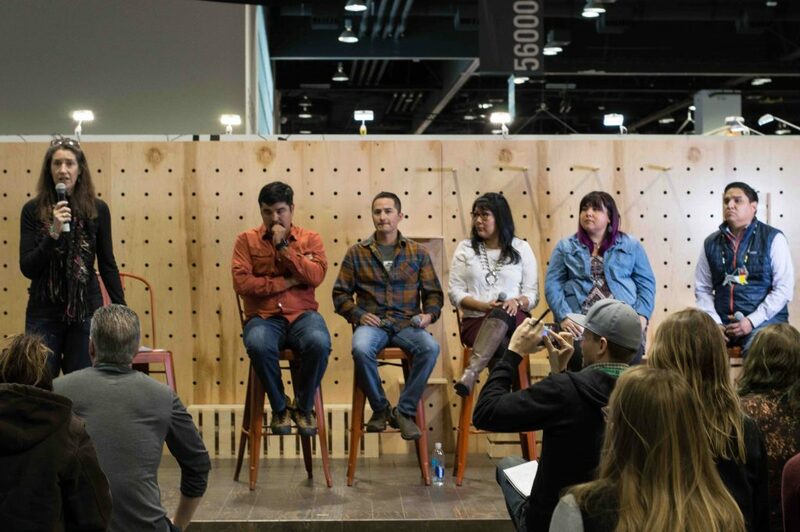 The panel represented entrepreneurs, industry leaders and business owners from all across the outdoor industry, but the advice given was the same: a rising tide lifts all boats. Natasha Hale of the Grand Canyon Trust, pointed out that for native people, the idea that “if one is successful, we are all successful” is part of the intergenerational ties of land history. Shanti Hoges, founder of Hike it Baby, has created a community where family members of all ages can come together on the trail—something that is not often seen. Their advice for leadership in the industry? Create a better sense of awareness and teamwork as well as mentorship relationships, and be willing to listen to different experiences. In looking at white and privileged women especially, this responsibility extends to making space at the table for women of all different backgrounds in the workforce. There are 640 million acres of “public” land in the US where the native tribes don’t have a management role. It is estimated that before colonialism, 10 million native people lived here, and after colonialism, this number dropped down to as low as 300,000. Those native people that avoided slaughter and disease were forcibly evicted from their lands and their culture by way of aggressive anti-native schooling and a ban on speaking the native language. Most native tribes do not benefit from the tourism and recreation that happens on their lands. Six million people visit the Grand Canyon annually, but the Havasupai people only generate income from the relatively few 20,000 who visit Havasu Falls, which is under their management. This is not a mistake. Public lands were stolen from native people and set aside for white consumption. Indigenous people recreate differently, and often have a different relationship with the lands. Understanding the bloodshed and the differences in cultures provides an invaluable alternative viewpoint for the land management. It is appropriate for some Native and tribal lands to be off-limits to people who do not belong to those groups. In some cases, troubling history of white climbers paying off tribal members to allow them climbing access with reservation areas has lead to those places being closed to all climbing, even for tribal members. If you choose to recreate on tribal lands and lands managed by native people — do your research and ask permission first. A quick Google search will tell you the creation stories of those lands, a stop in the local tribal and cultural centers will inform your visit and a meeting with the tribal elders will give you a chance to ask permission to enter and climb. This creates tangible and beautiful connections. There are some things that transcend translation. Ultimately, the way forward is through listening, respecting and working together towards best practices of stewarding the land. There is a big difference between ignorance and arrogance. Don’t use native imagery, like “tribal” fabric patterns if you didn’t collaborate with a native artist to create that pattern. Don’t use language like “find your tribe in the outdoors”— it’s insensitive and cruel. Be humble when you’re corrected. Ninety percent of national parks are within 100 miles of a reservation. The outdoor industry can start by supporting tribal communities, cultural centers, tribal run programs, companies owned by native people and by employing native people. If companies refuse to change, it’s their loss. There is a sweeping tide of native artists, creators, writers and industry professionals who are going to do it better. Work together or get left behind. Final thoughts: the outdoor industry is a billion dollar industry that stands on slaughtered bodies. For example, there wasn’t anyone from the Arapaho and Cheyenne people (who are native to the Denver area) to represent their tribes at Outdoor Retailer. It’s about time we came together to build a better future. 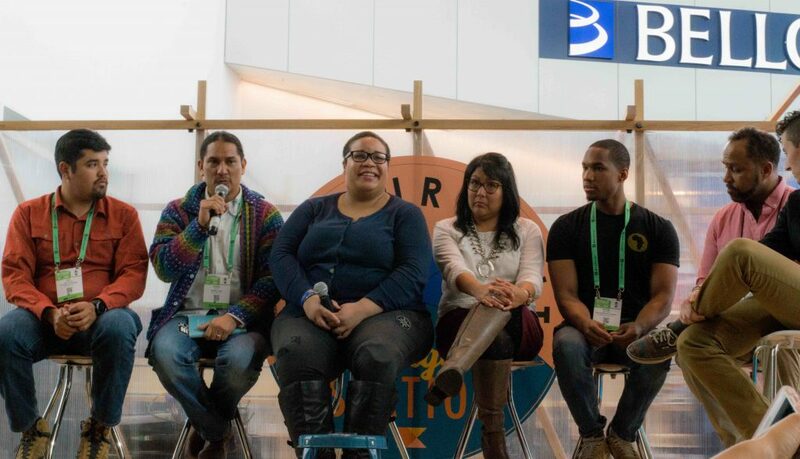 From left to right: Len Necefer PhD — founder of Natives Outdoors, Sergio Avila of the Sierra Club, Kareemah Batts of the Brooklyn Boulders Foundation, Jaylyn Gough of Native Women’s Wilderness, Mikhail Martin — co-founder of Brothers of Climbing, James Edward Mills of The Joy Trip project and author of The Adventure Gap, and moderator Elyse Rylander — the executive director of OUT There Adventures. If it’s starting to look like there are a lot of familiar faces on the panels, it’s because there are. Diversity in the outdoor industry may have been a hot topic at OR this year as far as panels go, but there’s still a lot of growth that needs to happen. Together, this panel represented a lot of diversity and different identities, with several people holding intersecting identities. To them, allyship doesn’t mean speaking for them—it means elevating their voices so that they can speak for themselves — and recognizing that no one person speaks on behalf of their entire community. Allyship in the outdoors includes knowing that no one accomplishes anything alone, and that it’s not enough to invite diverse people in; there needs to be encouragement and support once they are part of the community. For people with visible diversity, just showing up makes someone think differently. Mikhail’s dream for the future includes an OR where we don’t need to have these kinds of events. The question is, how do we get there? We can’t grow as allies unless we are prepared to be uncomfortable. Diverse people need to be employed at all levels of the outdoor industry, not just in retail, but in management and decision-making levels, too. In this industry, as in many others, money talks. The most powerful allies will be in corporations and large financial stakeholders. However, it’s not all bad news. There are many businesses that are supporting diverse communities by employing people from those backgrounds and providing access, resources and opportunities. Native -owned Natives Outdoors, as well as Brooklyn Boulders, International Federation of Sport Climbing, American Alpine Club and Adidas have all been financial backers of projects and trips spearheaded by diverse people. 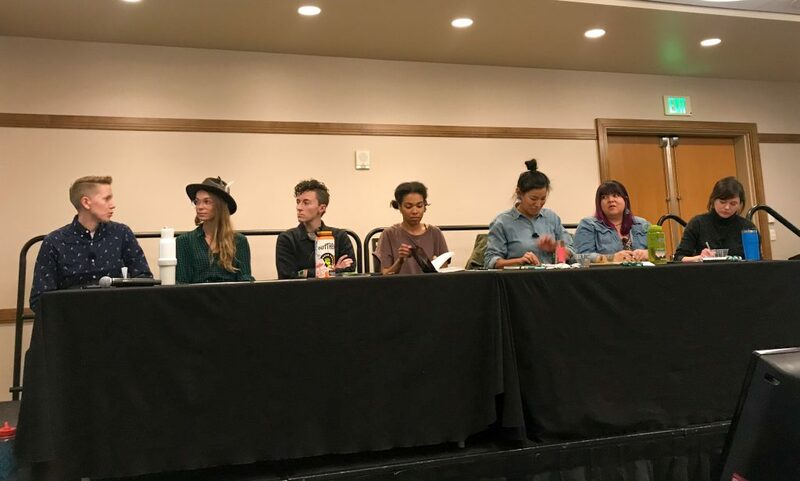 From left to right: moderators Jenn Brunson and Katie Boué (both of Outdoor Industry Association), Elyse Rylander — Executive Director of OUT There Adventure, Brooklyn Bell — outdoor athlete, Shelma Jun — founder of Flash Foxy, Jolie Varela — founder of Indigenous Women Hike and Gale Straub —founder of She-Explores. This panel was comprised of leaders in the digital space who are using their social media presence to drive the next generation of outdoor advocacy. They spoke about using social media for positive change on the topics of public lands, climate change, diversity and local community issues. Their take: the more we share each other’s work, the louder our voices become. If mainstream media won’t give us the attention, we will create it for ourselves within our own communities. They had strong words for industry brands and people within positions of decision-making and power: you shouldn’t be afraid to make mistakes, but you should be able to admit when you have missed the mark. It’s up to the companies to convince everyone why they think it’s a bad idea to feature more diversity, rather than the other way around. Instead of showcasing token diversity as a way to put a checkmark in a box, there has to be a connection with those communities. Ask communities of color how they relate to the outdoors, and engage with that. It’s on the people who are making decisions to make better decisions, but it’s on everyone else to give them the grace to make mistakes—for people and brands alike. And finally, we need to put our money where our mouths are. It’s not enough to support diversity on social media by liking and reposting (although that’s also critical). There needs to be comprehensive change at the management level to become more supportive of outdoor advocacy changes. If you feel exhausted reading about all of this, I felt that way too. A lot of the diversity panels were scheduled for the same day and featured the same people, leaving many feeling like it was less about change and more about tuning in to a fad. Ultimately, the conversation about diversity is not something that should happen every six months at Outdoor Retailer events. Like Jose Gonzales of Latinos Outdoors emphasized at the diversity luncheon that fell back to back between two other diversity panels that day: just like a drum beat that falls too rarely to have a pattern, we need to have more than just panels on diversity. For those of us with power, we need to step up when we can use our positions to help, step back when it is time for others to speak, and step to the side to allow our peers to speak for themselves and stand with them while they do that. It might seem discouraging and overwhelming, but forward direction is made with taking small steps.